Do you feel overwhelmed going through hundreds of games to analyse? Cut the chase game ,save your time and focus on our pre analysed odds games to re analyse on them and increase your monthly winning experience by over 100% compared to your previous months. Join the Monthly analysed odds package that gives you 12 well analysed games daily for 30 days for you to choose from according to your own genius style of professional sports betting. Do you like to play with single bets odds and some time with multibets? That only yourself have selected? to help you win more regularly? Do you have your own style of games selection and combination that you believe is guided by a higher power and winning guardian angels assigned to you only? 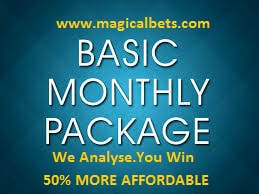 Join the thousands using our Monthly analysed odds package now,at over 50% lower costs of our normal analysed odds.